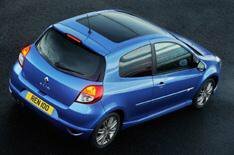 Revamped Renault Clio | What Car? A face-lifted Renault Clio will be unveiled at next month's Geneva motor show. On sale in the UK from May, the updated Clio will get a new front end (borrowing heavily from the recently launched Megane), along with a restyled rear bumper and tail-lights. A sporty new GT model will also go on sale at the same time. The GT will get a bodykit, stiffened suspension and twin exhaust pipes. An integrated sat-nav will also be an option with the new Clio. Developed in conjunction with TomTom, the new Carminat' system will cost around 500, and incorporate traffic and speed-limit information, as well as safety camera locations. We'll be at the Geneva motor show from March 3, so check back then for a full overview of the new Clio, as well as loads of other new models and motoring news direct from the show.